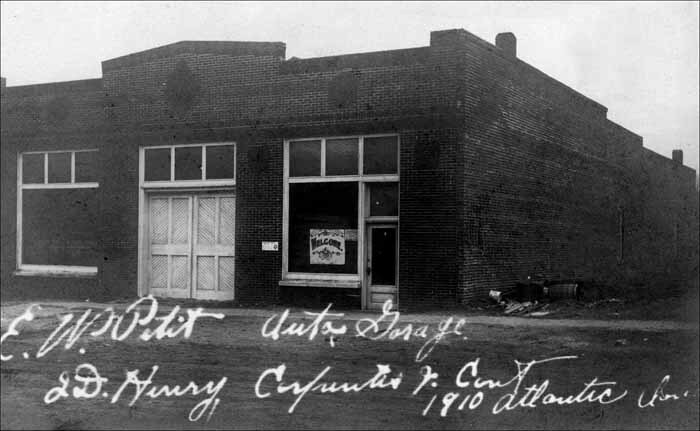 This unused photo postcard reads "E. W. Petit Auto Garage", "J. D. Henry, Carpenter & Cont., 1910, Atlantic, Iowa." The contributor believes the garage was located in Atlantic, but there is no further documentation with the photo itself. 1910 Federal Census records list an Edwin W. Petit in Atlantic. Edwin's occupation is given as partner in a livery stable. This is most likely the same individual and business.